We sell our 100% grass fed and finished, slow grown, Angus beef in late fall thru spring. We harvest fat, finished animals directly off pasture. The beef is harvested at about 22 months of age. Whole and 1/2 beef are available. The meat is processed, freezer packed and quickly frozen. All animals will be hung and processed at Ferndale Meat Company with traditional maturing for three weeks. Please contact us by email to check availability. When you buy by the whole or 1/2 beef you get to choose your meat cuts. It is a special order based on your preferences. You will be charged on the actual lbs. of meat you receive. Frozen meat will keep at a very high quality for up to 12 months, after which quality will begin to degrade slowly. It is possible for bones and offal to be included in your order, but if you are purchasing less than a whole beef, please remember that you are sharing a whole animal and so the availability of the bones and offal will depend on the customer you are sharing your beef with. 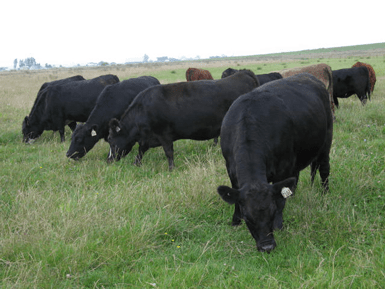 Because nature is not uniform and animals vary in size, so do our beef cattle. Therefore, we cannot give you an exact weight for each product, only an approximation. About 425 – 475 lbs. of boxed meat (after aging, cut and wrap) and requires about 16 cubic feet of freezer space. About 215-240 lbs. of boxed meat (after aging, cut and wrap) and requires about nine cubic feet of freezer space.